Could you have undiagnosed diabetes? Many of the symptoms of diabetes can be subtle. Maybe you’re thirstier or more hungry than usual. Perhaps you’ve noticed patches of darker skin in your armpits, elbows, knees, groin, or on your neck. Or you can’t figure out why you’re more tired than usual. All these symptoms can be caused by type 2 diabetes. Of the 30.3 million American adults living with type 2 diabetes, 7.2 million of those people have undiagnosed diabetes according to statistics from the American Diabetes Association. An additional 84.1 million adults in the U.S. have prediabetes—blood sugar levels that are higher than normal, but not yet high enough to be classified as diabetes. The Centers for Disease Control and Prevention (CDC) found that of those 84.1 million adults with prediabetes, 70% will develop diabetes over time. Nerve damage, which is also called neuropathy, causing tingling, numbness, burning sensation, and pain. Neuropathy usually begins in the toes and fingers, then spreads up the limb. Neuropathy can also cause erectile dysfunction. Damage to the feet due to poor blood flow. Untreated cuts and injuries to affected feet can cause infections, which are more difficult to heal in people with diabetes. In some cases, these infections can lead to amputation. Based on your risk factors, your doctor will let you know how often you should be screened for high blood sugar. 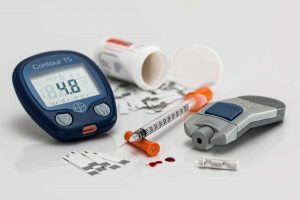 If you have prediabetes or normal blood sugar levels but are at an increased risk of developing diabetes, your doctor will recommend lifestyle changes that can lower your risk, including losing weight; eating a healthy diet that’s lower in unhealthy fats and sugar and includes more fruits, vegetables, and whole grains; quitting smoking; and getting at least 30 minutes of moderate intensity activity per day. Depending on your current blood sugar levels, your doctor may also recommend medication to lower your blood sugar.